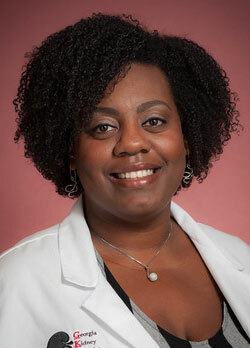 Kimone James, MD was born in Hudson, New York. Dr. James completed her internship and residency at Ochsner Medical Center in New Orleans, Louisiana. She completed her fellowship at Wake Forest Baptist Medical Center in Winston Salem, North Carolina. Dr. James resides in Marietta with her husband and two children. In her spare time, Dr. James enjoys reading, traveling and spending time with her family. Dr. James primarily sees patients at our Austell and Douglas locations.